Jump for joy because Green Revolution’s new Joysticks have hit i502 markets. To celebrate the launch, Ray and I spent a sunny Saturday exploring Seattle. From flying high with their sativa or seeking relief with CBD and yoga, these pre-rolls make it easy to puff our preference. We started the day a very Seattle way, with a sativa, pitstop at Ghost Alley Espresso and pictures around the infamous gum wall. Next, we smoked a little hybrid in a rooftop garden. After we relaxed with yoga and CBD in the Sculpture Park. Our day wrapped with an indica around the Space Needle. We smoked joint after joint. Each one burned evenly with clean, white ash. What a wonderful weekend lighting up with Wikileaf and Heylo Cannabis! 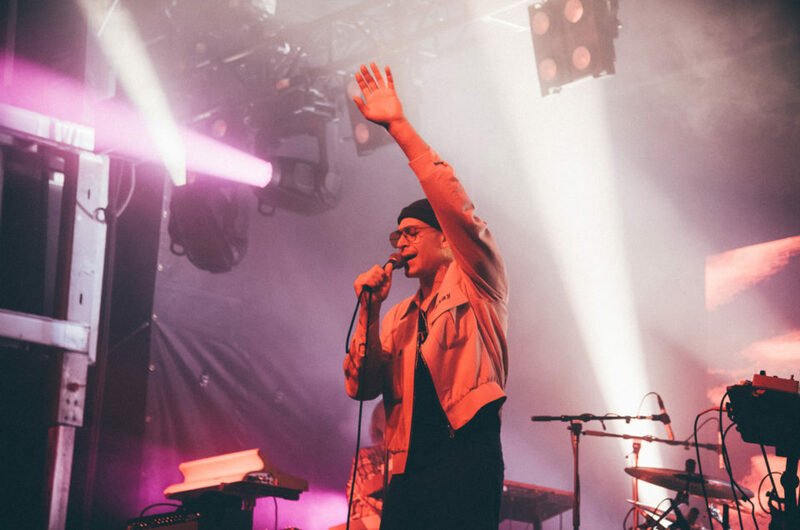 Heylo and Wikileaf host an event called Heylo Sessions merging two of our favorite things — marijuana and music. This session took place at an especially stunning venue, The Winston House. The Winston House is a cannabis-friendly bed and breakfast located in the heart Seattle. This space is speckled with crystals and house plants and it oozes positive energy. Or is that the epic afternoon light? Either way, there are dozens of nooks and crannies to take photos, light up and kick back. And that’s exactly what we did. From the forest to the city, I take Tarukino’s cannabis beverages everywhere. 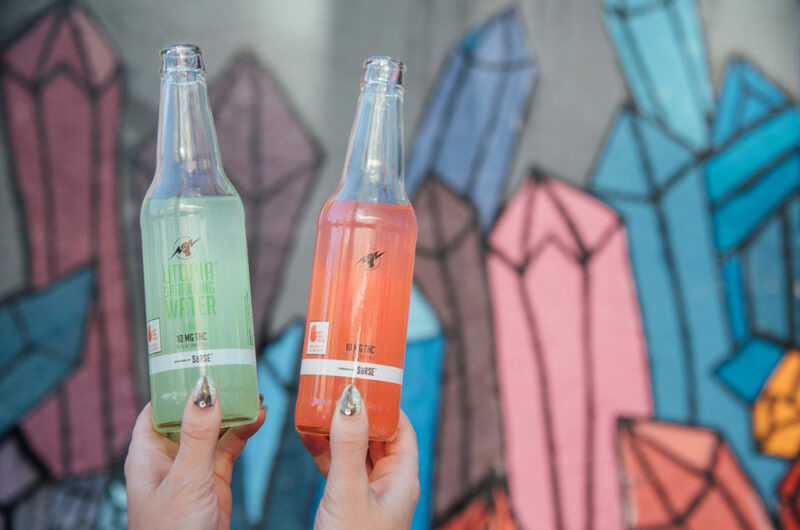 Whether we’re adventuring in the mountains with Happy Apple, or shooting photos around Capitol Hill with Utopia, I love the natural flavors and relaxing high of these drinks. Our adventure started in the mountains at Rattlesnake Lake. This is one of my favorite places to enjoy the effects of cannabis. Hiking to the ledge or shooting photos lakeside, Happy Apple is the ideal addition. If you like sparkling cider (this girl can drink a bottle of Martinelli’s in one sitting) you will love these beverages available in 10mg, 30mg and 100mg. Happy Apple tastes like real cider — because it is. You’ll only find Washington grown apples in these bottles! #TBT to getting mile high, making memories and jamming out to my favorite musicians at 420 On the Block. This epic event is Denver’s only three-day 4/20 music fest, so you know it’s lit. I couldn’t wait to hang with Ladies of Paradise and connect with the Colorado cannabis community. My weed filled weekend started on April 19th with a flight to Denver. I checked into the Moxy Cherry Creek, which is a cute boutique hotel in a fun part of town. Ladies of Paradise arrived shortly after. We celebrated with drinks and a smoke sesh. Ok, I also took a nap… Then we kicked off our arrival at Sensi Magazine’s party. I even recognized a few familiar i502 faces — @DominiqueDabs and @RespectMyRegion! I'm dedicating this Weed Crush Wednesday to the talented henna artist and cannabis advocate, Natasha Singh. 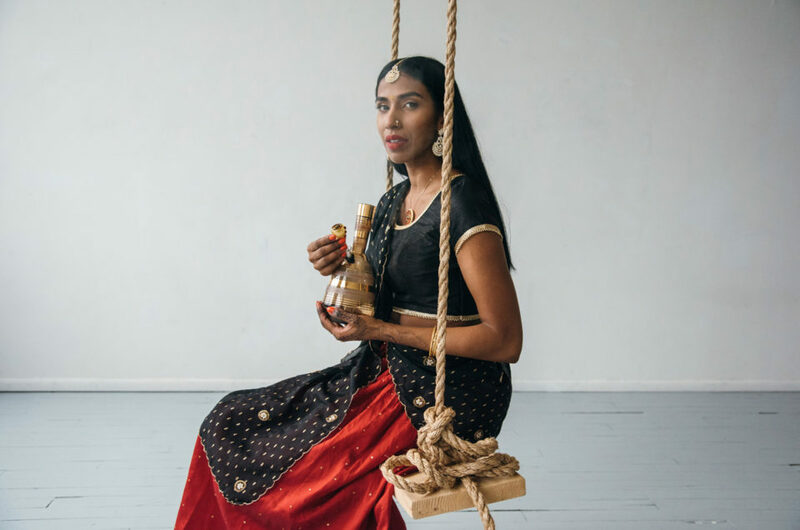 I recently spoke with Natasha about her art, how cannabis influences it and what it's like breaking down barriers for Indian women in the cannabis community. How long have you been doing henna? What got you into it? Tell me about your backstory. It was like 2008, 2009'ish. I was working at BECU at a call center and I picked it up as a hobby. I became so obsessed with it I decided to quit my job and go to beauty school. It's been a fun journey, I've been self-taught. I went from drawing on my hands, to drawing on paper to drawing on family members. Is it Fashion Friday or Flashback Friday? It’s hard to tell when I’m dressed like a flower child. 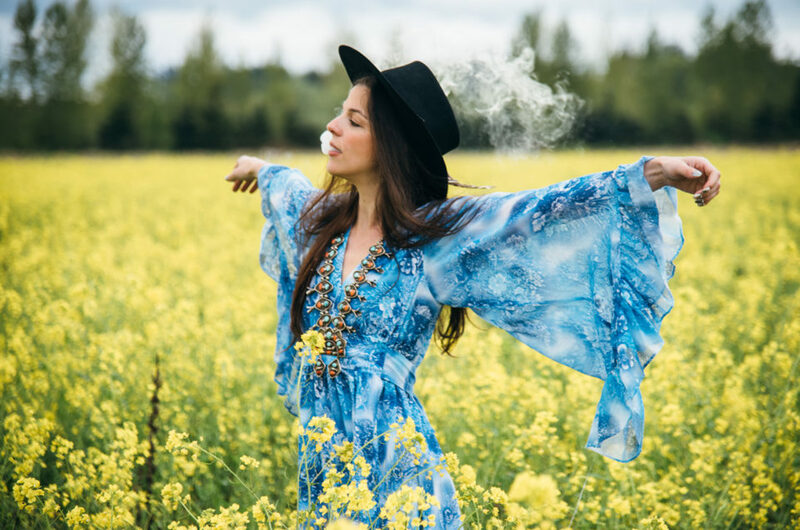 This vintage dress from Fauxy Furr Vintage is perfect for flower fields or festival season. I spotted this flower field en route to Chrysta and Jill’s house for a Fauxy Furr sleepover. I think it’s another one of my marijuana manifestations, because I’ve been dreaming of a shoot like this. When I told the ladies my vision, Chrysta pulled this blue beauty out. Boom, photo vision accomplished! 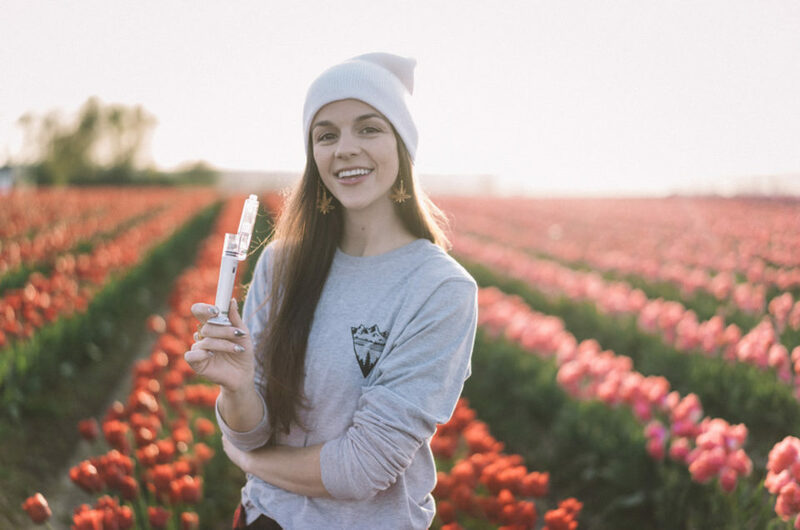 Stop and smell the flowers, but if you’re smoking them make sure to bring your Ooze cannabis accessories. Whether I’m running through flower fields or smoking flower at home, these pieces are perfect for my active lifestyle. My friend Flynn and I adventured to one of my favorite places, the Skagit Valley Tulip Festival. I’ve shot at this scenic spot the last two years and the colors never get old. Reds, whites, pinks and purples line the fields as I lit up my favorite flower — Mary Jane. This weekend I hosted a meet-and-greet at Bellingham’s newest cannabis retailer — Smoking Crow. I mingled with customers, spoke with staff and photographed this cozy shop that carries some of the best weed in Bellingham. Smoking Crow’s philosophy is “cannabis leads to community.” Similar to crows, who roost together to cultivate strength in numbers, Smoking Crow believes in the power amongst the cannabis community. Staff work as a team to supply the highest quality products in an atmosphere that feels like home.